'Tis the season. Doxie Doodle, my 4th generation surf dog, rode his first big Christmas parade without the basset brothers, his mentors, who retired last year. Needless to say, without the solid, reliable, slow motion basset brothers on board, things went a little haywire. We love our small town community of Hood River, Oregon. 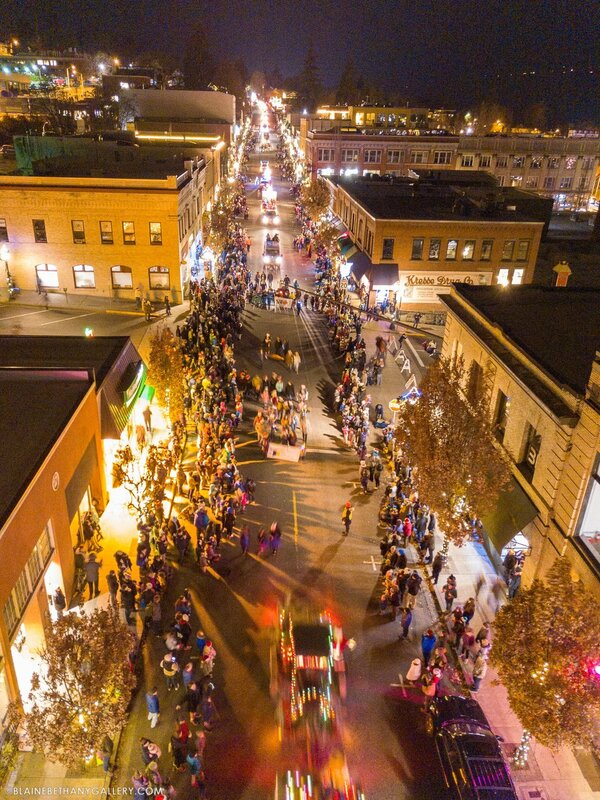 Here thousands and thousands of people don't live - but somehow they all show up for our annual Holiday Parade and Tree Lighting on the first Friday of December. Can you believe another year whizzed by? Hug the one you're with. P.S. Thank heavens every moment isn't absolutely perfect. Wow, somehow life steps in when you need it most. I've been sick since the parade, wondering if the pain was worth it. And dog people reached out. Thank you! I've been home in bed, sick as a (excuse me) dog. Wondering if all I am doing is writing to myself here (dogs don't write back.) But then Christmas came early - with an email this morning and fun Facebook comments - you saved me. The only good thing about being sick is - your fur kids are so very glad they can paste you down in bed. They save me, too. Just had to let you know how much I enjoyed this post. Loved seeing you & Doodle surfin’ in the Christmas parade. I had the same reaction as you when Doodle leapt off the board- OH! Hope all is well there in Hood River, it sure looks like a beautiful place to live. Sandy Camillucci - We saw that! Lol! So much fun ~ thank you for the smiles Barb ~ you are awesome! Patrick William Quigley - Putting the stoke in Christmas! Great to see you Barb Ayers with surf dog float (which is usually floating on water). It’s All Good in the Hood!! Erica Gerald - It was fun to see your puppy take off! Good recovery. :) As always, nice float. Bill Zimmerman - Go Hood Riverites and the Gorge folk! Dog People are the best kind of people there are.